Who does not want to have a healthy breakfast at home without spending too much time in the kitchen on a busy morning? 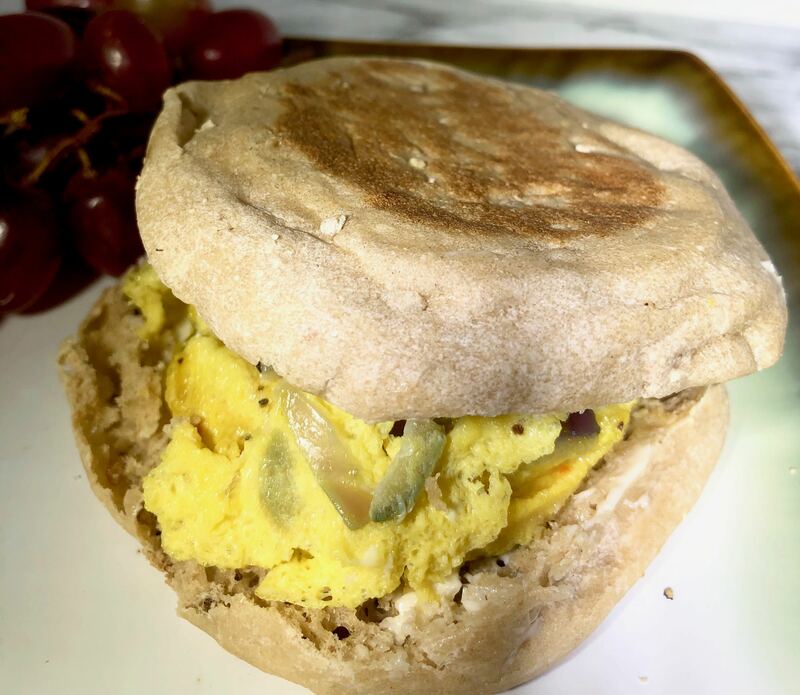 My husband came up with a 5 minute quick and easy breakfast sandwich idea with Egg and English Muffin. I executed the idea and we loved it. This breakfast egg sandwich has become our staple breakfast nowadays. To find if an egg is fresh, place it in a bowl of water. If it sinks, it is fresh. If it floats, it is stale. I buy a pack of English Muffin and eggs as part of the weekly grocery. I add a little bit of onion, green pepper (capsicum) and red bell pepper in this sandwich. If you do not have the green and red bell peppers at home feel free to use cilantro or spring onion. You can also add a pinch of ginger. In a cup spray oil, crack an egg in the cup, add the veggies, a pinch of salt. Now beat the egg lightly. Now cook the egg in the microwave for 45 seconds. I advise to cover the cup inside the microwave while cooking the egg, otherwise, the egg may spatter out all over the microwave. While the egg is cooking in the microwave, toast the English Muffin in the toaster. If you do not have an English Muffin at home, feel free to use any sliced bread. Now spread butter on top of the bread, add the cooked egg, sprinkle black pepper on top of the egg and the sandwich is ready to eat. You can add cheese on top of the egg. You can also add ketchup or honey mustard or sriracha sauce on top of the egg. 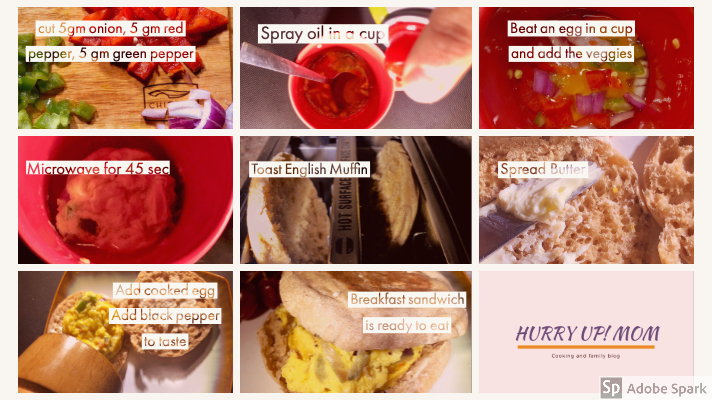 Delicious quick and easy breakfast sandwich cooked with egg and english muffin, ideal for on the go breakfast in a busy morning.